For Google’s smartwatch users, life is feast or famine. We spent so long waiting on Google to do… something… anything to re-energize its smartwatch platform while Apple and Samsung powered ahead (and Fitbit joined the party). But after the rollout of Android Wear 2.0 in early 2017, very little happened. The more rivals like Apple and Samsung improved, the more Google stayed the same (every Apple Watch has shipped with a new processor and software update). To the point you'd have been forgiven for wondering if Google even cared about smartwatches anymore or, like so many other Mountain View projects, its wearable platform had been put out to pasture. But earlier this year, something did happen: Google renamed Android Wear to Wear OS. Big whoop. But then Google announced a total revamp of the software, just in time for Qualcomm’s new smartwatch chips. Wear OS users have had a gluttonous few weeks, and now the software update is rolling out via and OTA update. Is this Wear 3.0 already? Google tells me it doesn’t have a name for the update, nor will it reveal a number. “We're calling this the next evolution of Wear OS,” said a spokesperson. I’ve been using the new Wear OS for a few days, and the best thing I can say is that it’s tempting me back over to Google. Let me explain. These days I find myself switching between the Apple Watch and Fitbit Versa. But now I’ve spent a few days with the new Wear OS on a Skagen Falster, I don’t want to take it off. The major factor keeping it on my wrist is the new Google Assistant, which isn’t just waiting for you to talk to it but - swipe right to open - now also lives in a feed where it tells you about your day and suggests things you might want to see. Remember Google Now, the cards that would show up with information about your day? It’s a little like that. For example, I’ve been traveling a lot this week, so along with my upcoming events Google’s been showing me my flight times and some suggested requests for the Assistant, like one to ask it the current weather in Dublin (which is where I'm heading) and another to show me my reminders for the day. You can tap on these suggestions to activate them, rather than having to speak them out to the Assistant. Because while Google’s plan to have us all talking into our watches might sound great to Google, the reality is that most of us don’t want to. These proactive buttons are like little shortcuts. Right now there’s no way to tweak the things the proactive Assistant shows you, but when I spoke to Wear OS head Dennis Troper about it, he said this feed will become smarter over time as the Assistant learns more about you, and as Google continues to update it. And not all of the suggestions are specifically about your day. Among those showing for me now, I can ask Assistant to tell me a joke or a random fact. I’ll admit I’m a little more liberal with my data than I probably should be in 2018, but it means Google is able to learn lots of things about me, and in turn the proactive Assistant (Google’s not really given it a name as such) will likely be more useful. I’m also really liking how the new Wear OS tackles notifications. It’s not a dramatic change, but rather than having your messages fill the screen Google’s created a scrollable feed, which you swipe up to access. This crams more information on the screen at once; tap a message, and some suggested smart replies will appear beneath it, so you can respond quickly from the wrist. I’ve never really been a fan of smart replies, although it at least feels like Google is trying to target the right canned responses. Often it's just a "Yes", "No" or an "Ok", but in some cases I've had a more useful "Thanks" or even an emoji, depending on the contents of the message. If you’re someone who likes custom responses, the new notifications feed makes this process a little faster and easier. I should add that I'm using my watch with a Pixel phone. If you're an iPhone user, you won't get quick replies on iMessages due to Apple's restrictions, but otherwise the experience will be the same. Overall, notifications feel a bit more manageable in the new Wear OS. There are other changes I'm enjoying too, but they haven’t improved my Wear OS experience as dramatically. Swiping left will now take you to the new Google Fit, giving you a look at your heart points and move minutes throughout the day (I’m using the Fit watch face, so this is always displayed for me anyway). Finally, Google’s rejigged the Quick Settings pane, accessible with a swipe down, with a shortcut button for finding your phone and another for Google Pay. My Skagen Falster doesn’t have NFC so I don’t see Pay on my screen, but I can tell you I’ve used the phone finder once already. 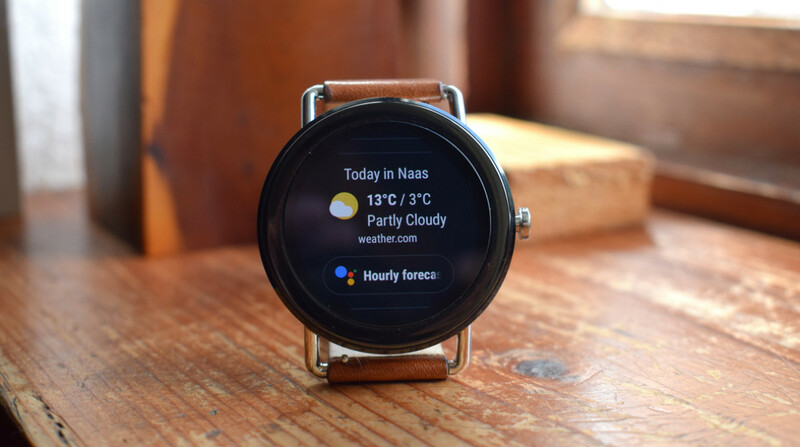 Google’s update might not be all that revolutionary, but it refines and cleans up Wear OS while thinking more carefully about how we all really use our smartwatches. It feels a little more responsive, less cluttered and - above all, and possibly for the first time for myself - enjoyable to use. But the sad truth is that none of this is enough for Google, and the Apple Watch Series 4 was a reminder of just how far behind its biggest smartwatch rival is right now. The new Wear OS (or whatever we’re calling it) shows that Google is taking things seriously, but it needs to do more. Regular updates would be a start; we don’t want to wait another two years for the next big overhaul. Meanwhile the new Qualcomm processors will hopefully spur Google’s partners to make even better smartwatches, even if the new technology is a bit of a half-step forward. Hopefully this is a sign that Google is ready to bring the fight, and I can't wait. I wonder if I will get the update since I'm on android 9 DP2 (with my Huawei watch 2).. If not, do you think it will be worth downgrading back to android 8 and gain these feautres? Yea, was worth it. Flashed back the old image, and almost a day after got the update. "But the sad truth is that none of this is enough for Google, and the Apple Watch Series 4 was a reminder of just how far behind its biggest smartwatch rival is right now"
Care to elaborate? This by itself says nothing... Maybe an article comparing the two?